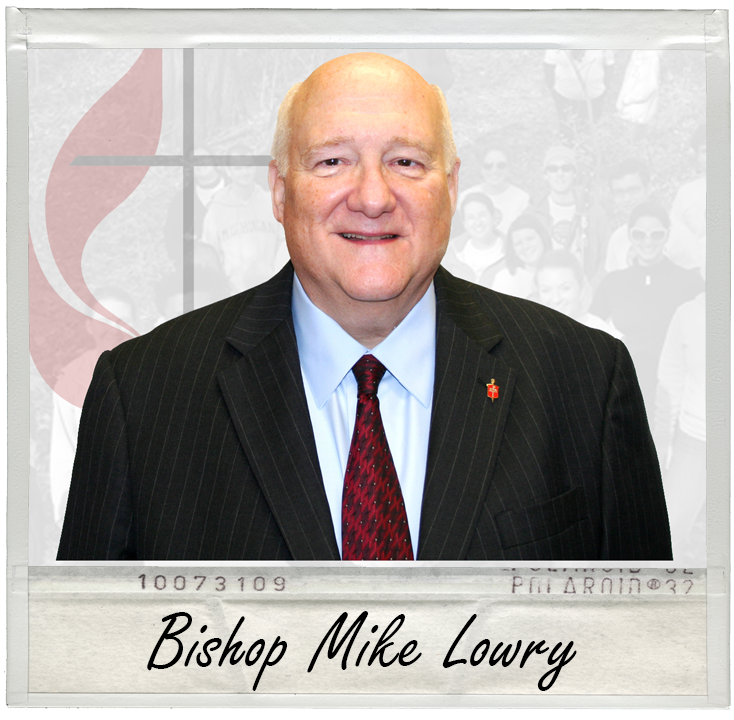 Bishop Mike Lowry is the resident bishop of the Central Texas Conference of The United Methodist Church / Fort Worth Episcopal Area, where he is the spiritual leader for approximately 154,000 United Methodists in as many as 320 congregations and developing faith communities. At the time of his election and consecration as bishop in July 2008, he was serving as executive director of New Church Development and Transformation in the Southwest Texas Conference in San Antonio, Texas (now a part of the Rio Texas Conference). Prior to that, he served as senior pastor at University United Methodist Church, a 5,800 member congregation in San Antonio that grew from 4,800 to 5,700 members during his tenure. His previous appointments include United Methodist Churches in Austin, Corpus Christi, Harlingen and Kerrville and, while a student, serving Plymouth Park in Irving, Texas. Churches under his leadership have received a number of awards and recognitions including Habitat for Humanity, the President’s Award from Hutson-Tillotson College, the Churchmanship Award from San Antonio Community of Churches, and the Arthur Moore Evangelism Award three times. Bishop Lowry is a regular blogger at his post, “This Focused Center.” Publications include: “Generous Living” sermon, Best Stewardship Sermons of 2005; contributor to Abingdon Preaching Annual 2003 -2011; “Order,” Finding Our Way: Love and Law in the United Methodist Church ; “Engage For Such a Time as This,” Missio Dei and the United States: Towards a Faithful United Methodist Witness (The General Board of Higher Education and Ministry, The United Methodist Church). He has been awarded the B’nai B’rith Award in Social Ethics by Perkins School of Theology and the Harry Denman Evangelism Award by the Foundation for Evangelism (2015). A 1972 graduate of Earlham College in Richmond, Indiana, Bishop Lowry earned his Master of Theology from Perkins (at SMU) and his Doctor of Ministry from Austin Presbyterian Theological Seminary. He and his wife Jolynn have a son Nathan & daughter-in-law Abigail and grandsons Simon & Adam; daughter Sarah & son-in-law Steven and grandchildren Grace & Sam. Family time over the years has included trekking in the national parks, an adventure they still enjoy as time and schedules permit. If you want to keep up with Bishop Lowry - what he's doing, where he's traveling, what's bouncing around in his episcopal brain, etc. - make sure that you are following his "This Focused Center" blog. Following the Uniting General Conference which brought together the Church of the United Brethren in Christ and the Evangelical Church in 1946, Ralph M. Holdeman was asked by Bishop George Edward Epp, the Secretary of the Board of Bishops, to develop a crest for them. The chi rho made in the shape of a cross is one of the most ancient symbols found in the catacombs. The alpha and omega is then suspended from the cross arm. The staff not only points to the bishop as the chief shepherd of God's flock but also emphasizes the loving care that should motivate all administrative decisions. The staff is a baroque design because in the Baroque Period the Church expanded with missional/evangelistic zeal, often exhibited and led by the bishop. Frequently a bishop would go into the fields to preach, carrying a pointed staff to stab the ground as the Gospel of love and concern, of salvation and resurrection, was proclaimed. The bishop of today must serve Christ and the Church in a modern world setting and so modern lines are utilized in make the shield of the crest.